On 11 December 2015, High Commissioner of India Shri Y.K. 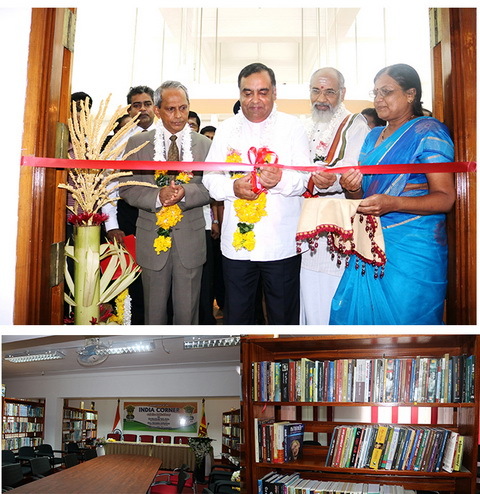 Sinha launched the India Corner at the Jaffna Public Library, in the presence of Mr. H.M.G.S. Palihakkara, H.E. the Governor of the Northern Province, Justice C.V. Wigneswaran, Hon’ble Chief Minister and Mr. S. Thavarasa, the Leader of the Opposition of the NPC. The Collection at the India Corner consists of books on Indian history, Cultural Heritage, Economics, Story books, Children Books, Tourism, Leaders, Mahatma Gandhi, Philosophers, Paintings, Art and Culture etc. It has a particularly exciting collection of books on contemporary Indian literature. There is also a reference section with encyclopedia, dictionaries (English, Hindi and Tamil) and coffee table books. While the bulk of the books are in English the library also has a substantial number of books in Hindi and Tamil language.